Former Gloucester and England winger James Simpson-Daniel says he feels "in mourning" after announcing his retirement on Tuesday. The 32-year-old was forced to end his 14-year professional career because of a serious ankle injury he sustained during a game in November. Simpson-Daniel told BBC Radio Gloucestershire: "You feel like you've lost part of you. "I don't want to sound dramatic but that's how I felt. You're in mourning." He continued: "It feels like only yesterday I was sat at my desk at school, looking at my first contract. "That's all my life has been ever since and now here I am, all this time later, and it's about to stop. There's an element of what next?" 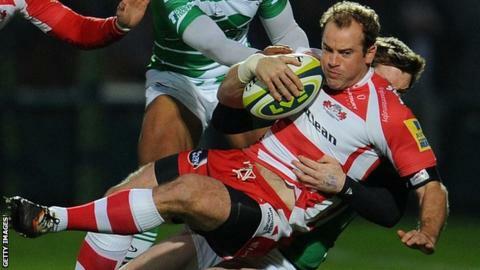 Having joined the Cherry and Whites from school, Simpson-Daniel scored a try on his first-team debut in 2001 and went on to make 272 appearances for the Premiership club. He earned 10 England caps, but his international progress was hindered after a bout of glandular fever in 2002 and ankle, back and shoulder problems that followed. The winger missed the majority of the 2012-13 season after having shoulder surgery and returned to action last summer, only to be ruled out again with a dislocated and fractured ankle he suffered in their game against Newcastle in November. The LV= Cup win was to be his last appearance for Gloucester as he was informed last week he could not return to the professional game. "Last Thursday was my final opportunity to run, to see if it was stable enough after the most recent treatment. Unfortunately that wasn't the case," he added. "The powers that be - doctors, surgeons, physios - said I needed to hang my boots up." But Simpson-Daniel said the messages of support he had received from the public had helped eased the situation. "The amount of support I've had has been amazing. It's not just Gloucester supporters - I've got Bath supporters and Welsh supporters tweeting their respects to me," he concluded. "I'm genuinely touched by the whole thing."